This DIY Halloween Candy Dish post is sponsored by the Sverve #smokehousebbq campaign. All thoughts and words are my own. Over the weekend I dug out my Halloween decorations and started to transform our house. I actually couldn’t believe we’re already only three weeks away from Halloween! I feel a little behind the ball on getting everything all set up. As I started to lay things out – the table runner, silly spider, ghost in a jar, pumpkins, you name it – I realized I was a little short on candy dishes. Then I remembered the candy dish that I had made when I was younger as a gift for my Gram. It was an easy project using terracotta pots, which I knew I had in my craft closet. Using the sponge brush paint both the terracotta pot and sauce black. When both pieces have dried thoroughly, turn the pot upside down. Run glue around the rim of the base and place the saucer on top. Place a book or other item on top and let glue adhere. 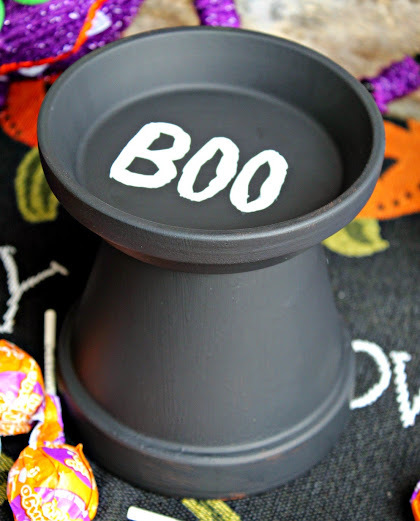 Once glue is dried and pieces are secure, use a small paint brush to pain the word “BOO” in white inside the saucer. You can use a stencil if you want, but I like the slight squiggle that freehand gives you; it makes it look a little scary. Once the paint is dry you can fill it with candy or other treats for your family or party guests. While you’re doing your party planning, consider picking up some of the new Farm Rich Smokehouse products to serve, too. The line includes Pulled Beef Brisket, Pulled Pork, Double Rubbed Dry Smoked Pork, and Double Rubbed Dry Smoked Chicken. Check with your local Walmart for specifics, as they’ll be having in-store tastings on October 24th, 25th, or 26th. Here’s a Farm Rich Smokehouse coupon you can use to save on your purchase, too. What are your favorite DIY Halloween projects? Thanks for sharing! This is something I would have never thought of! What a cute and fun idea! Not to mention super quick and easy to make. Thanks for sharing. Very cute idea! I love working with ceramic pots. I love the DIY Candy dish. You could easily change paint colors and make some for other holidays. What a great idea! I have several pots I have yet to use, and this will be perfect for them! I love this little candy dish Liza. What a great project for the kids. Love how cute this is and how easy it is to make! I need to bust out my creativity today and make something. Thanks for the inspiration. 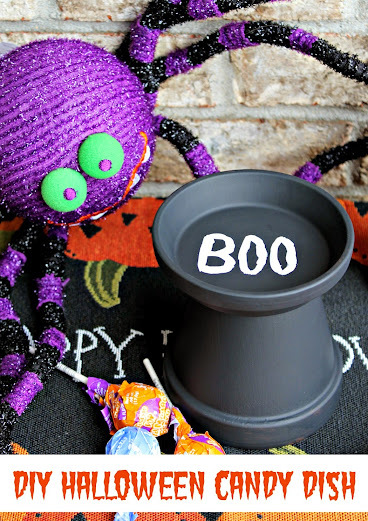 My favorite DIY Halloween projects are the easy ones! Love your candy dish! This is such a cute idea and very inexpensive. With the pots you could make different height ones and fill them up with different candies. Great idea! That is adorable! I love the little BOO! That is so cute and clever!! What a great idea. Not only is it cute it’s also budget friendly. Thanks Stephanie! Yes, less than $5 or so. Can cost even less if you find the pots on clearance during after-summer sales. You know, I just went looking for our candy dish and can’t seem to find it – I think I’ll be making one of these to replace it. 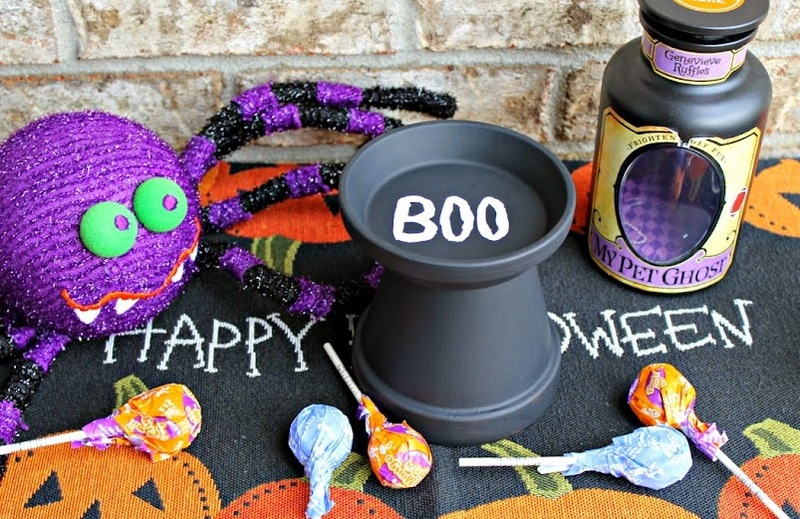 What a cute and easy way to celebrate halloween! Thanks Jennifer! Hope it turned out well. How creative! This looks so easy and something to get the kids involved in. I better get on the ball considering Halloween is only 11 days away! Thank you Emily! Fortunately it’s super-fast to make, so you still have plenty of time (though I can’t believe Halloween is already so close – eek!). I know! We started preparing in mid-September, so it’s surprising that it’s crept up on us so quickly! I love the fun and simplicity associated with this craft. Thanks to the cost, if you are a proud parent of multiples each one can make their own! That’s a great idea, Jenn! Would be really nice to let all the kiddos make their own. That’s a really cute DIY candy dish!! I love how easy it is to make it, too. This is an awesome idea! I could see doing something like for other holidays too. Very easy to change up for whatever occasion!